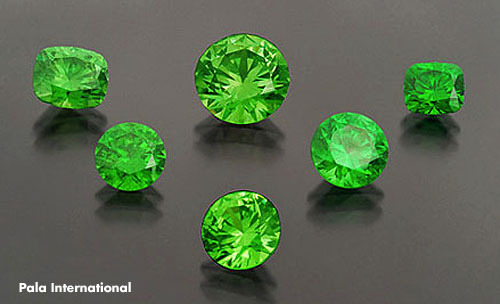 Known for their brilliant green color and fiery dispersion, demantoid garnets are unique because their inclusions — usually seen as flaws in other gems — are considered highly coveted aesthetic attributes. Garnet is the official January birthstone. Distinctive horsetail inclusions that seem to spray out from the center of the stone are markers for the world’s most valuable demantoid garnets, a variety mined in the Ural Mountains of Russia. A beautiful, well-formed inclusion can increase the value of the gemstone considerably, according to the International Color Stone Association. Demantoid garnet was first discovered in 1886 and became a favorite of Russian royalty and designer Carl Fabergé, who incorporated them into his famous jeweled eggs and other jewelry, such as the pin seen above. Russian mining of demantoid garnet was suspended after the Bolshevik Revolution in 1917, but finally resumed in the 1970s. Demantoid gets its name from the Dutch words for “diamond-like.” The stone owes its impressive brilliance to two main factors: A high refractive index and a high dispersion (its ability to separate light into the spectrum of colors). 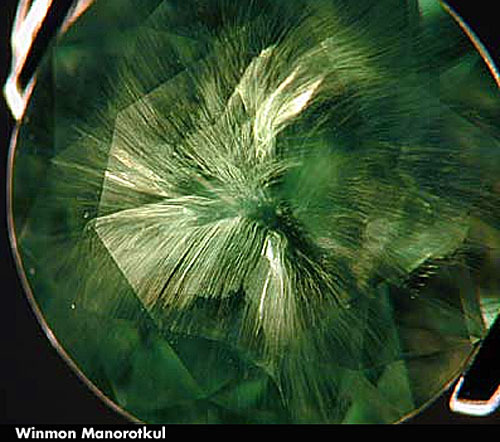 Demantoid's dispersion rating is the highest of all gemstones, including diamond. The horsetail inclusions are actually golden brown bundles of the mineral chrysotile. They seem to gather in the center of the stone and bend outward like a fireworks display. Although demantoid garnet is now mined in other parts of the world, including Iran, Namibia, Pakistan, Italy, Madagascar and Canada, the Russian demantoid sets the mark by which all the others are compared. 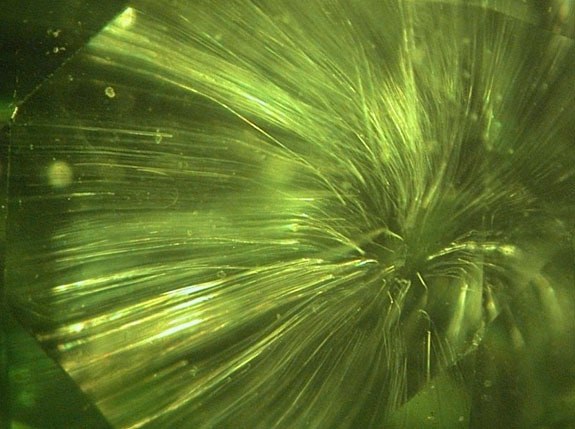 Demantoid by definition will always be green, but the color range varies from yellowish-green to blue-green. The lighter colors tend to have the most fire and brilliance, while the deeper green colorations tend to fetch the highest prices. 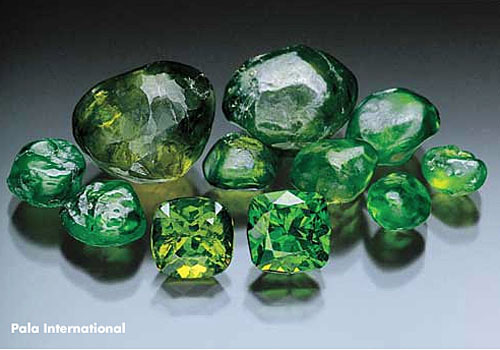 African-origin demantoid tends to be yellowish-green, olive green or brownish, due to higher concentrations of iron. Russian material, on the other hand, is colored by chromium and tends to be vivid green. Demantoid garnets are rarely found in sizes larger than 2 carats. Described as “near perfection” by Stylus Magazine, “Get the Party Started” charted in 17 countries and reached #4 on the U.S. Billboard Hot 100. It was the first single from Pink’s wildly popular second album called Missundaztood. The album sold more than 12 million copies and is her most successful to date. “Get the Party Started” is considered Pink’s signature song. She often performs it during the encores of live shows. Alecia Beth Moore (better known as Pink) was born in Pennsylvania in 1979. Originally a member of the girl group Choice, Pink launched her solo career in 2000 with the single, “There You Go.” The rest is history, as she has gone on to become one of the most successful and influential artists of her generation. "When Alecia Moore debuted in 2000, pop was dominated by long-locked blonds like Britney Spears, Christina Aguilera and Jessica Simpson,” wrote Glamour Magazine. “Pink changed the game. Without her, the last 13 years of big-voiced, tough chick music is hard to imagine." Pink is a three-time Grammy Award winner and was named Billboard magazine’s “Woman of the Year” for 2013. She’s notched 19 top-10 hits in the U.S. and has sold more than 45 million records worldwide as of 2013. Written by Linda Perry. Performed by Pink. 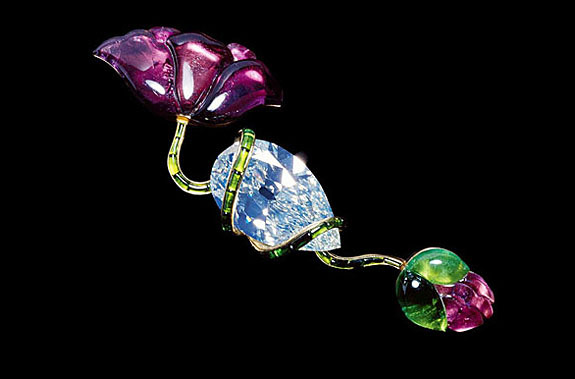 Considered a modern-day Peter Carl Fabergé, jewelry designer Joel Arthur Rosenthal is famous for his uncanny ability to “paint” with gemstones. His awe-inspiring sculptural interpretations of flowers, animals, sea life and even a lowly bagel — some 400 works in all — are on display through March 9 at the Metropolitan Museum of Art in New York City. The 70-year-old Rosenthal, who was born in the Bronx, but who has worked in Paris under the name JAR since 1978, has gained an international following for his uniquely off-beat colorful creations. It’s as if Rosenthal is painting with a palette of gemstones. In some pieces, there is a distinctive division between the colors, and in others, the colors blend seamlessly. He creates this effect with his precision pavé work, where he sets small stones so close together that they appear as a continuous surface of jewels. He has never been afraid to mix precious and non-precious stones, and is as comfortable working in platinum and gold as he is in titanium or aluminum. JAR produces only 80 to 90 pieces a year, which makes them even more precious. Poppy brooch, 1982. Diamond, tourmalines and gold. Private collection. (PHOTO BY KATHARINA FAERBER. COURTESY OF JAR, PARIS). 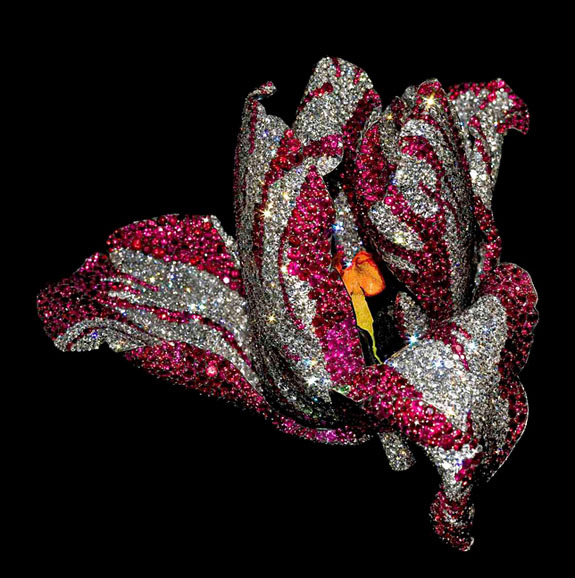 In May 2012, philanthropist Lily Safra auctioned 18 of her beloved JAR pieces at Christie’s to benefit her charity. The sale yielded nearly $11.5 million and was one of the highest-profile events of Christie’s season. 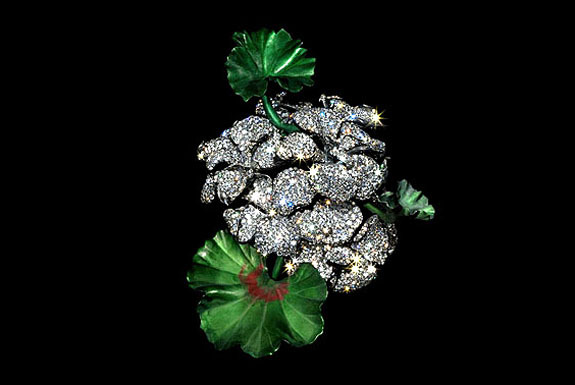 One particular item featured Safra’s 37.2-carat diamond cleverly camouflaged by JAR in the twisting stems of two poppies interpreted in pink and green tourmaline. 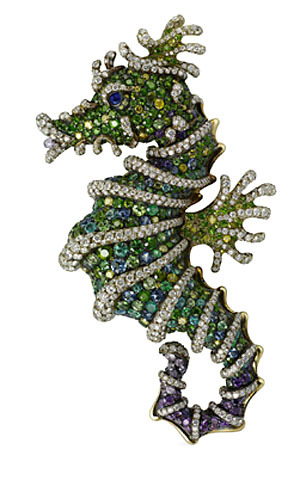 Butterfly brooch, 1994. Sapphires, fire opals, rubies, amethysts, garnets, diamonds, silver and gold. Private collection. (PHOTO BY KATHARINA FAERBER. COURTESY OF JAR, PARIS). 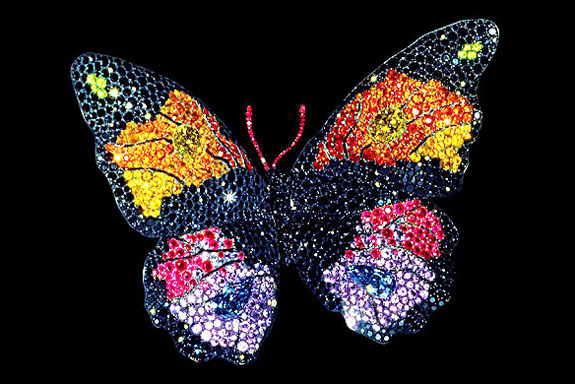 His 1994 butterfly brooch includes an impressive list of materials, including sapphires, fire opals, rubies, amethyst, garnets, diamonds, silver and gold. This is only the second time Rosenthal’s work has been on public display. The first was in London in 2002. The pieces in the current exhibition were nearly all lent by private collectors. 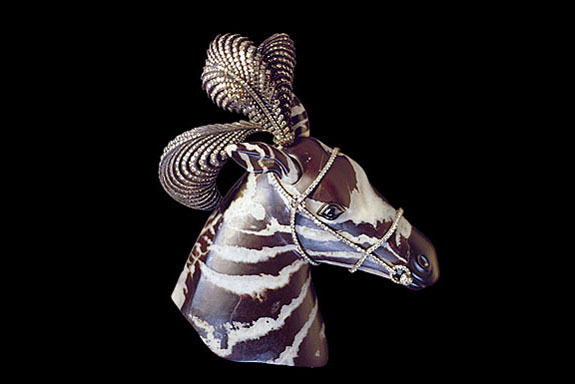 Zebra brooch, 1987. Agate, diamonds, a sapphire, silver and gold. Private collection. (PHOTO BY KATHARINA FAERBER. COURTESY OF JAR, PARIS). Critics commented that the show would have benefited from more documentation about the individual items, such as the rarity or source of the gems. But, Rosenthal wanted his visitors to focus on his creations without being distracted by explanatory captions or audio guides, according to The Economist. “Big Bang Theory” star Kaley Cuoco’s New Year’s Eve nuptials were all about the bling. From her scintillating halo-style engagement ring and twin wedding bands to her bedazzled finger nail and jeweled upside-down chandelier cake, there were so many facets flashing during the reception that new hubby Ryan Sweeting should have been wearing his shades. Cuoco flaunted her fashionable wedding bands for the first time while seated next to Sweeting on Celebrity Row during the LA Lakers basketball game on Friday. The paparazzi was able to zoom in on the pretty diamond-studded eternity bands that now complement her halo-style engagement ring. It appears Cuoco chose to separate the normally stacked bands so they could flank each side of the engagement ring. The engagement ring, which we detailed in a September 2013 post, features a 2.5-carat princess-cut center stone in a halo setting. Round accent diamonds are set half-way around the white-metal band and the ring is valued at $65,000. Attentive to every detail, the 28-year-old Cuoco accessorized her new bridal bling with a point-tipped manicure and a super-studded accent nail on her ring finger. StyleBistro.com reported that Cuoco’s nail artist used a slipper-pink hue on the bride’s fingernails and then applied a glittery silver shade on the nail of her ring finger. Over the silver, she applied 35 rhinestones. 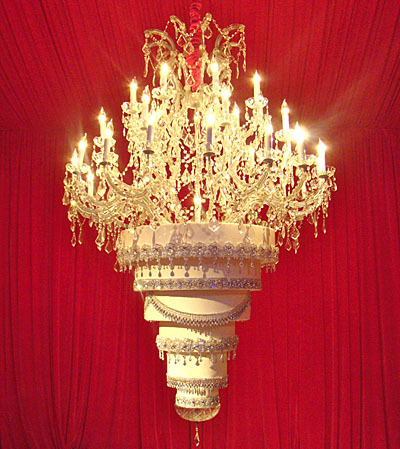 And there was more… Cuoco hired The Butter End Cakery in Los Angeles to build a six-tier wedding cake — dripping with purple rhinestones — that would be suspended upside down from a crystal chandelier. No, this was not your typical upside-down cake. 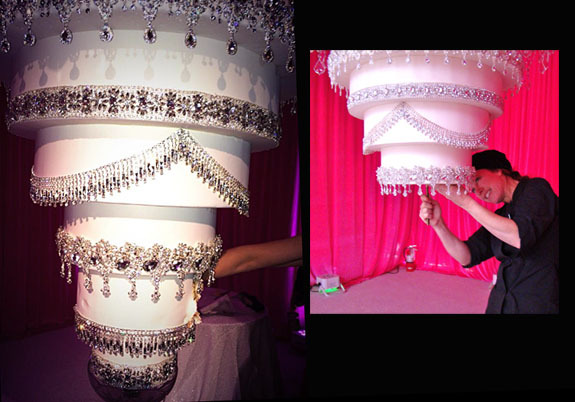 The size, weight and logistics of hanging (and eventually serving) a six-tier wedding cake upside down required six weeks of planning and execution. The cake designer actually used sandbags to simulate the weight of the cake to test whether or not the chandelier could hold the load. The only things marginally conventional about the cake were the flavors: Almond with toasted almond cream cheese buttercream frosting on one half and chocolate almond cherry with cherry cream cheese buttercream frosting on the other. Also on Twitter this week, Cuoco changed her name to Kaley Cuoco Sweeting. The majestic Taj Mahal — one of the Seven Wonders of the Modern World and arguably its greatest monument of love — required 20,000 laborers, 1,000 elephants and 20 years to complete. By comparison, it took 45 days for 15 artisans to craft a shimmering silver- and gold-clad replica studded with 50,000 diamonds and cubic zirconia. Called “Wow! 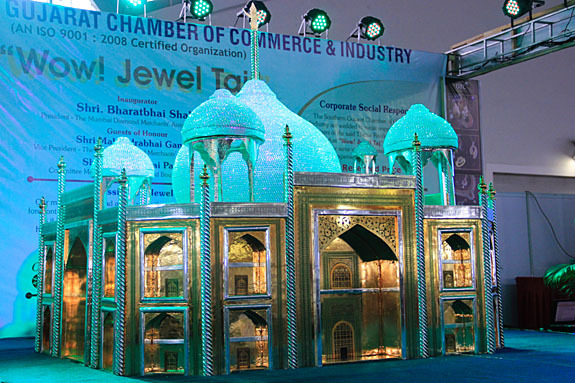 Jewel Taj,” the nine-foot-tall replica was presented by the organizers of the Sparkle International jewelry show in Surat, India, to showcase the brilliance of Indian design and craftsmanship. Organizers boasted that more than 40 pounds of silver and 3.3 pounds of gold were used to adorn the impressive replica, which mimicked the main mausoleum and four towering minarets of the actual Taj Mahal. A Thailand-based firm donated 35,000 cubic zirconia in 8mm, 9mm and 10mm sizes to support the project. The “Wow! Jewel Taj” artisans were inspired by their visit to the Taj Mahal in Agra, a 42-acre marble mausoleum complex built in the early 17th century by a grief-stricken Emperor Shah Jahan as a memorial to his beloved wife, Queen Mumtaz Mahal, who died during childbirth. According to legend, with her dying breath Mumtaz asked her husband to build her a mausoleum more beautiful than any in the world. Six months later, the foundation was laid for the Taj. The tombs of the Emperor and his wife are aligned side-by-side inside this beautiful piece of architecture. Its original design featured precious gems embedded in its walls. The valuable stones were plundered and looted by the foreign invaders, but the structure remains magnificent. 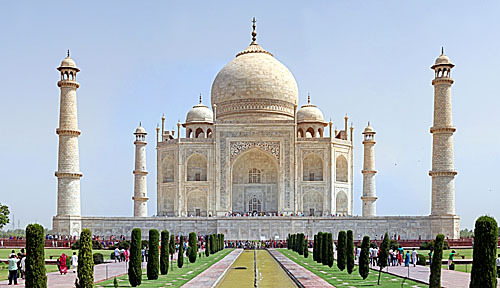 Often called the “Jewel of India,” the Taj Mahal is recognized worldwide as a tribute to unconditional love. More than four million people visit the site every year. “Wow! 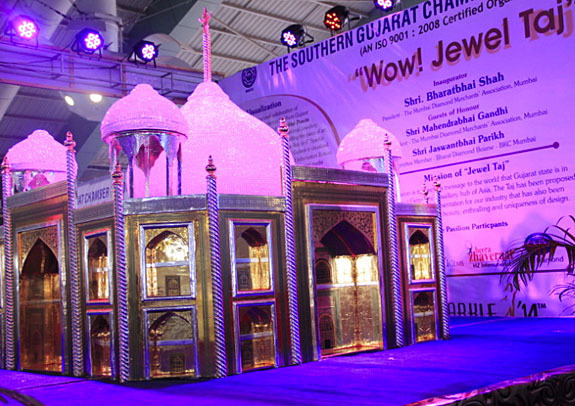 Jewel Taj” was intended to be auctioned off to benefit a girl’s education program of the state government, but no bidder was able to meet minimum price of 125 million rupees (about $200,000). Sports power couple Rory McIlroy and Caroline Wozniacki made it official on New Year’s Eve in Sydney, Australia, where the sixth-ranked golf star proposed to the 10th-ranked tennis star with an impressive halo-style engagement ring. McIlroy asked for Wozniacki's hand against the romantic backdrop of a magnificent fireworks display over the Sydney Harbor Bridge. The ring’s cushion-cut center diamond, which is surrounded by a halo of smaller pavé-set round diamonds, is estimated to weigh at least five carats, and experts pegged the value of the ring at $250,000. 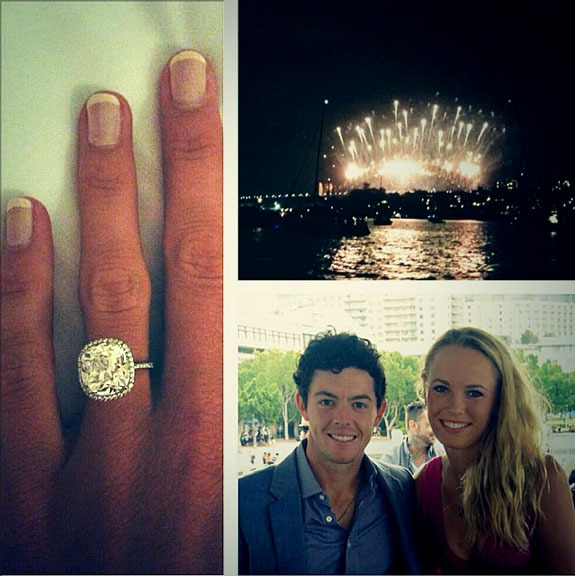 On New Year’s Day, Wozniacki (23) and McIlroy (24) reported the news of their engagement with a photo collage of the couple, the ring and fireworks over Sydney Harbor on their respective Twitter pages. McIlroy went out to his 1.8 million followers with the following tweet: "Happy New Year everyone! I have a feeling it's going to be a great year!! My first victory of 2014 #shesaidyes!!" “Rory and I started 2014 with a bang! 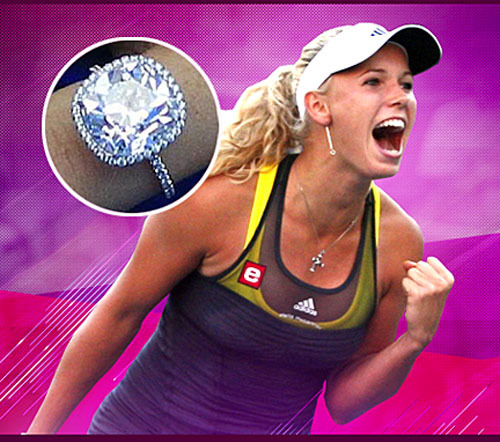 I said YES!,” Wozniacki tweeted to her 580,000 followers. The couple was in Australia on New Year’s Eve in preparation for Wozniacki’s participation in the Sydney International tennis tournament. The former number-one-ranked player was unexpectedly ousted in the second round, but Wozniacki was still on Cloud 9 as she spoke to the press about her fiancé and their plans for the future. "He had asked my parents for permission, like traditional, which was great,” she said. 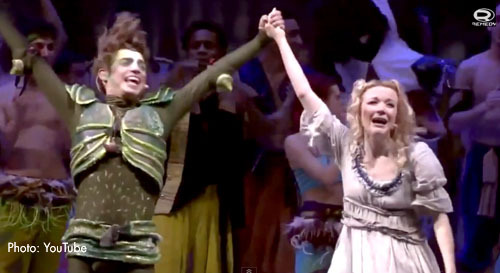 “It's a special moment, a special time in our lives. It's amazing to have everything set in the personal life, and we can really focus on our games and the year ahead of us in the sport. I think this was the best possible way to start off the year." The New Year’s Eve marriage proposal puts to rest recent rumblings in the Irish Press that the couple had broken up. The Danish Wozniacki and Irish McIlroy (also previously ranked number-one in the world) have been dating since the summer of 2011. They have yet to announce their wedding plans. Welcome to Music Friday when we bring you great songs with jewelry, gemstones or precious metals in the title or lyrics. Today we present “Vindicated,” a tune very familiar to the legions of Spider-Man fans from around the world. Heightened by diamond imagery, “Vindicated" is the inspirational theme song of Spider-Man 2, a 2004 international blockbuster that raked in $783 million. 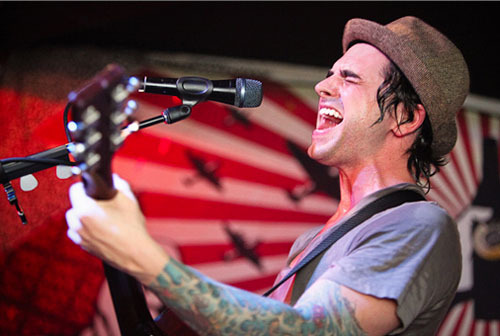 Chris Carrabba, the frontman for Dashboard Confessional, reportedly wrote “Vindicated” in less than an hour after previewing the movie. Inspired by the story of a young man, Peter Parker, struggling to manage his personal life and duties as a superhero, Carrabba penned the powerful lyrics steeped in the universal themes of hope, vindication, accepting one's flaws and celebrating one's strengths. In an interview with MTV, Carrabba discussed the movie and his song: “There were themes of hope and strife and struggle of a young man trying to become a grown man, and rebelling against what he knows he's supposed to be, and what he thinks he would like to be. And that, if you remove the super powers, is a fairly universal theme." “Vindicated,” which was played over the film’s end credits, was featured on both the Spider-Man 2 soundtrack in 2004 and on Dashboard Confessional’s 2006 album, Dusk and Summer. The albums were commercial successes, with each breaking into the top 10 on the Billboard 200 chart. Written by Chris Carrabba. Performed by Dashboard Confessional. Nearly a year removed from her famous flop while heading to the stage to accept her Best Actress award at the 2013 Oscars, Jennifer Lawrence endured another faux pas on the red carpet of Sunday’s Golden Globes when a diamond bracelet slipped off during an E! interview with Ryan Seacrest. 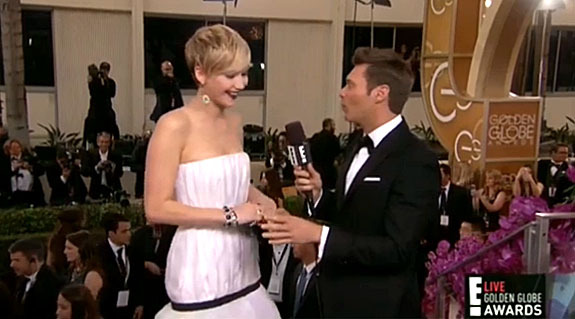 The red-hot actress, who took home the Best Supporting Actress award last night for American Hustle, was telling Seacrest about her white Dior dress when one of her bracelets became unhinged, slipped off her wrist and landed on the interview platform. The inside story about last year's Oscar slip finally came to light recently in Lawrence’s interview with W Magazine. On her way to the stage to accept her award for Silver Linings Playbook, she was thinking, “cakewalk, cakewalk, cakewalk.” Actually, the actress was supposed to be thinking “kick, walk, kick, walk,” which is how her stylist told her to manage the long dress she was wearing. She was supposed to kick the dress out while she walked. Otherwise, she risked getting the fabric stuck under her feet. “I totally forgot because I was thinking about cake! And that’s why I fell,” she revealed. For the Golden Globes, she wore a strapless white dress that was accented with a black band at the waist and the hips. In addition to the multiple diamond bracelets, she sported deep red lipstick and wore jade teardrop earrings by Neil Lane. 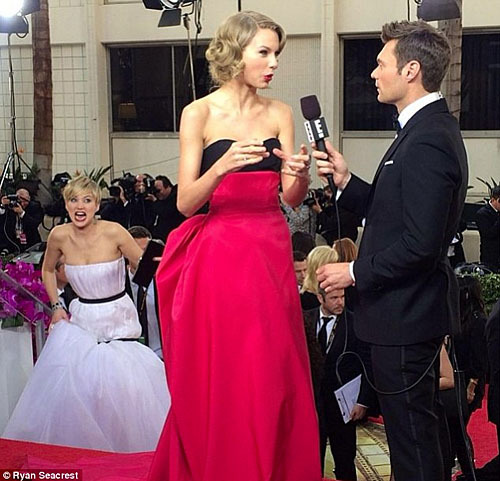 Earlier in the evening, the fun-loving Lawrence photobombed Taylor Swift’s live interview with Ryan Seacrest. In mid-interview, she invaded the interview stage with a maniacal look on her face. The “polar vortex” that delivered a dangerous blast of icy conditions and record-cold temperatures to much of the U.S. last week is being credited with helping to solve the five-year-old mystery of a lost wedding ring. 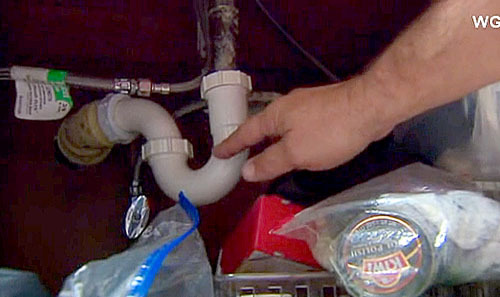 In Willowbrook, Ill., homeowners Tara Catogge and husband Ian Comes were battling frozen pipes and trying to noodle out why no water was flowing to their second-floor bathroom when Comes decided to clean out the U-shaped trap below the sink. Amazingly, embedded in the gunk and “looking disgusting,” according to Comes, was a ring. 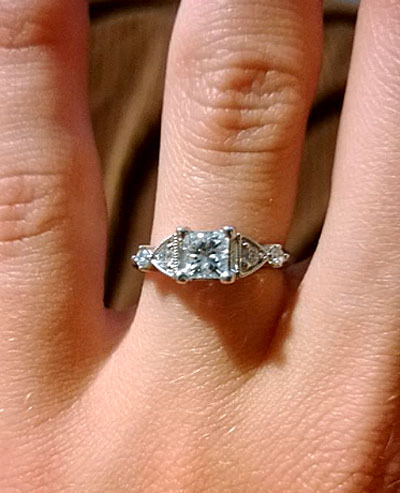 No, this wasn’t just an ordinary ring. 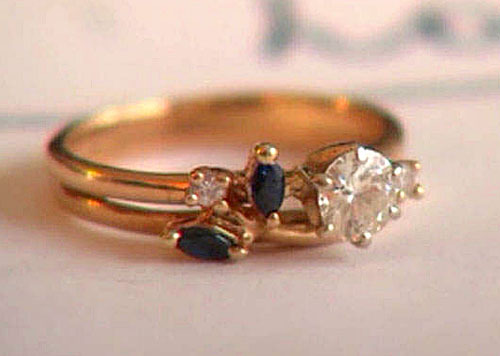 After they cleaned it up, they could see it was a diamond-and-sapphire wedding ring. "It looked old and important to somebody, so that's when we started the search," Catogge told Chicago’s WGN. 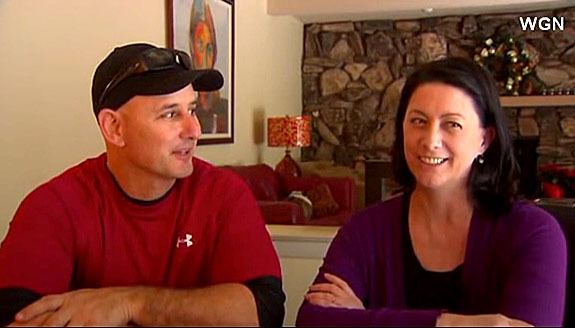 Their investigation led them to the previous homeowners, Louise and Randy Hearne, who are now living in Colorado. Catogge was able to get a surprised Randy Hearne on the line. Catogge learned that the previous homeowners lost the precious wedding ring five years earlier and had searched for it in vain. Louise and Randy assumed that it had been lost at a family gathering and was gone forever. Now they’re thrilled to get it back. The ring was delivered to the Hearnes on Saturday and is now back where it belongs — proudly displayed on Louise’s finger just in time for the couple’s 40th anniversary celebration. 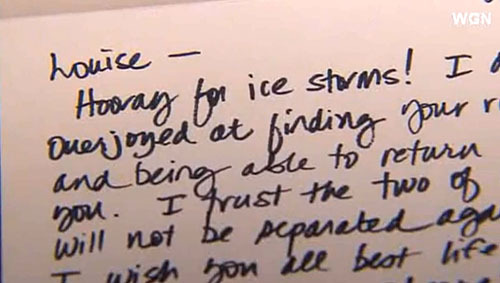 Catogge included a heartfelt note with the package: "Louise, Hooray for ice storms! I am overjoyed at finding your ring and being able to return it to you. I trust the two of you will not be separated again..."
In the end, Catogge and Comes will always remember the “polar vortex” a little differently than their flash-frozen neighbors. “We have nothing but the fondest feelings about this horrible ice storm. It's a happy New Year, indeed," she said. 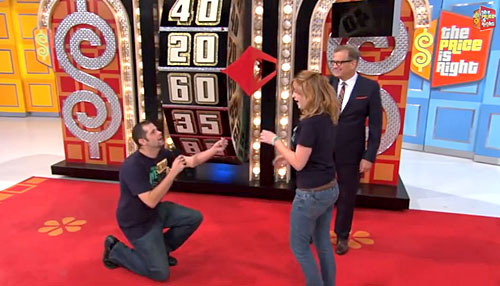 Friday will be remembered as “The Best Day Ever” by Morgan Welge of Elk Grove, Calif. Not only did she win $35,957 worth of prizes on The Price Is Right, but she also accepted a surprise on-stage marriage proposal in front of an ecstatic studio audience, a stunned Drew Carey and five million CBS viewers. Welge, a 25-year-old English teacher, had just spun a “90” on the Big Wheel — qualifying her for the final Showcase — when boyfriend, Nicholas Parker, joined her on the stage with a diamond engagement ring in hand. 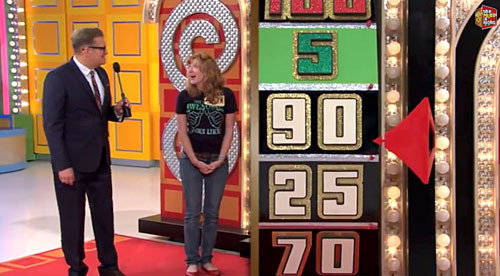 In the final Showcase round, the contestant who guesses the retail value of the prizes without going over is the winner. Welge bid $26,400 on a package that included pearl jewelry, a trip to Bora Bora and a Jeep Patriot SUV. The actual retail price of the package was $28,607, a difference of only $2,207. Welge ran over to the part of the set where her new Jeep was displayed and jumped into the arms of her new fiancé. Then she showed off her engagement ring to one of The Price Is Right models, who was obviously impressed. As Once Upon a Time star Jamie Chung made her way into the InStyle and Warner Bros. Golden Globes afterparty on Sunday night, all eyes were drawn to her mesmerizing new engagement ring. 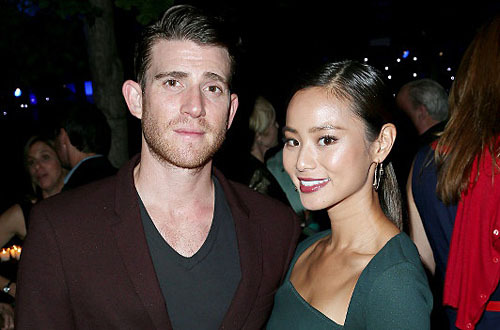 Actor Bryan Greenberg popped the question over the holidays in Chung’s hometown of San Francisco and the attractive couple celebrated with a New Year’s vacation to Turks and Caicos. The paparazzi got its first glimpse of Chung’s ring last Thursday when the beaming couple was spotted shopping in Los Angeles, but the Golden Globe afterparty allowed for a much better view of the impressive sparkler. The 4-to-5 carat round center diamond is encircled by a halo of smaller diamonds and set on a gorgeous pavé split-shank band. Chung, who says she's an "actress by day and inspiring blogger by night," has a visually impressive blog called WhattheChung.com. It's the 30-year-old's creative outlet to share her journeys on and off the set. She writes about fashion, food and whatever is inspiring her at the moment. The site is loaded with photos of Chung modeling her favorite items. Chung and 35-year-old fiancé Greenberg, who is famous for his role as Ben Epstein in HBO’s How to Make It in America, first started dating in 2012, but didn’t go public with their romance until April of 2013. Now the couple is reportedly working together on a new movie called A Year and Change. 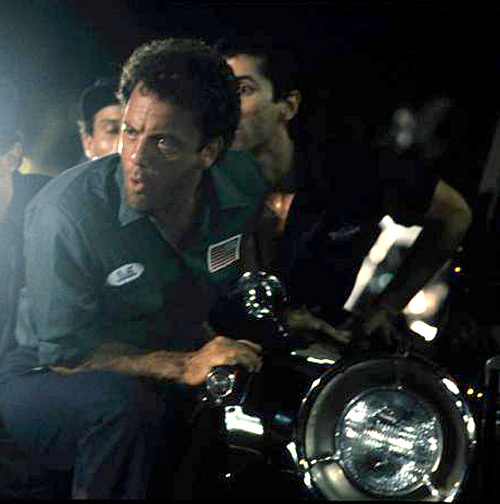 Greenberg stars as Owen, a down-and-out vending machine proprietor, who decides to make wholesale changes in his life after falling off a roof at a New Year’s Eve house party, according to IMDb.com. 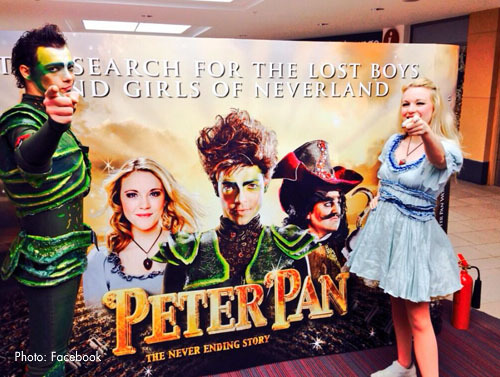 The movie is slated for a 2015 release. Welcome to Music Friday when we bring you great songs with jewelry, gemstones or precious metals in the title or lyrics. Today we flash back to the summer of ’76, when Starbuck was topping the charts with “Moonlight Feels Right,” a classic tune that stars a University of Mississippi class ring and includes one of the finest marimba solos ever performed in a pop song. “Moonlight Feels Right” was Starbuck’s debut single and a huge hit, reaching #3 on the Billboard Hot 100 list. What most people don’t know is that the song and the band were thisclose to obscurity. 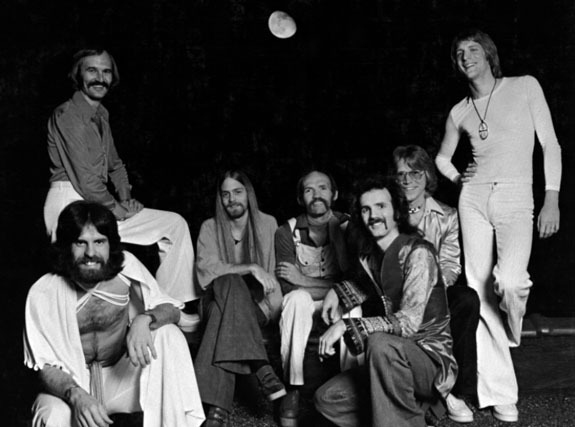 Founding band members Blackman and Bo Wagner revealed to the AP in November of 1976 that they traveled more than 8,000 miles in their cars, visiting 200 stations and working on a budget of a scant $5,700 ($700 from the record company and $5,000 of their own money) in a relentless, but fruitless, effort to get radio deejays to play the song. The musicians had to give up after 4½ weeks when the money ran out and Blackman’s car was repossessed because he couldn’t keep up the payments. Luckily, a single Birmingham deejay put the song on his play list and it quickly sold 18,000 copies in one week. The money generated by the Birmingham sales gave Blackman and Wagner the funds to go to San Francisco, where they presented the song to disc jockeys there. “Moonlight Feels Right” was on its way, wrote the AP. Please check out the video at the end of this post. It features a summer 2013 reunion of the original band and includes Wagner performing what is widely considered to be the top marimba solo in pop music history. Wagner’s solo starts at the 2:10 mark. The lyrics are below if you’d like to sing along. Written by Bruce Blackman. Performed by Starbuck. 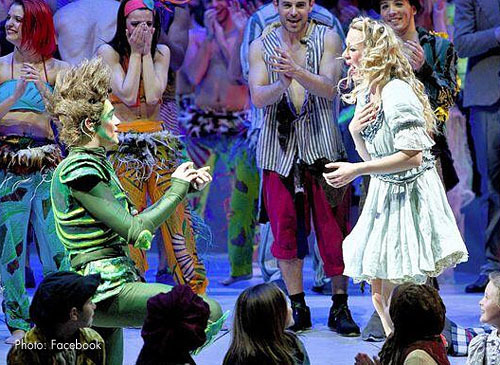 Stunned theatre-goers in Glasgow learned that fairytales do come true when they witnessed Peter Pan’s real-life marriage propose to Wendy Darling at the end of last Friday night’s show. The video of the event went viral, with more than 2.3 million views on YouTube. 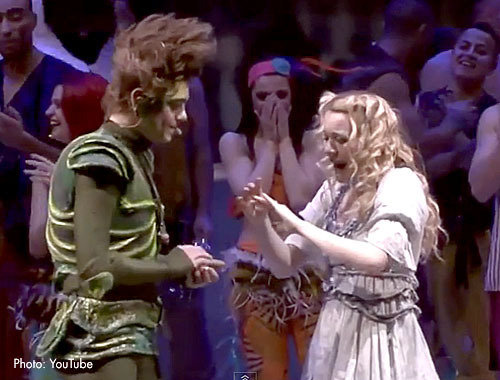 Sandor Sturbl, who plays the title role in Peter Pan: The Never Ending Story, stopped the show during the final number to ask for the hand of Lily-Jane Young, who plays Peter’s love interest, Wendy. 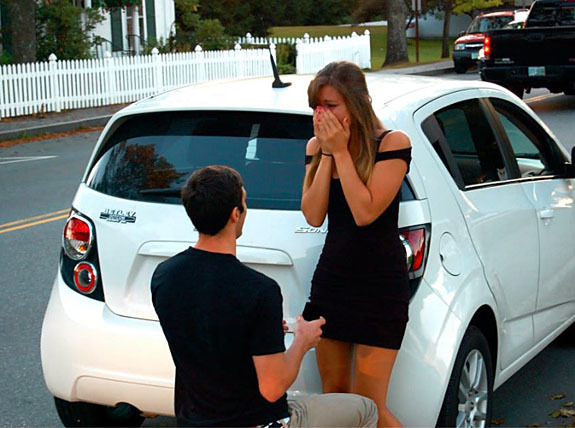 There was hardly a dry eye in the house as Sturbl delivered his heart-felt proposal to a surprised and overjoyed Young. With her microphone still on, the audience could hear her tearful, emotional sobs as the unscripted, romantic drama played out. 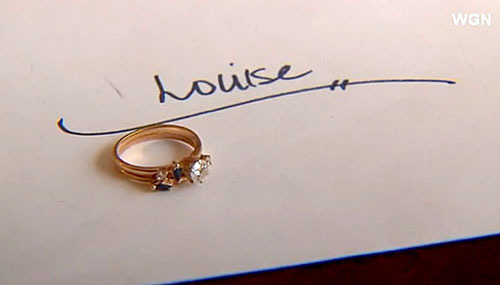 Sturbl explained that this was the perfect moment and the perfect place to deliver his proposal because Young was born in Glasgow, her family was in attendance and the audience was filled with Scottish people. An overwhelmed Young said, “Yes.” Then Sturbl placed a blue sapphire-and-diamond engagement ring on Young’s finger and the couple embraced. 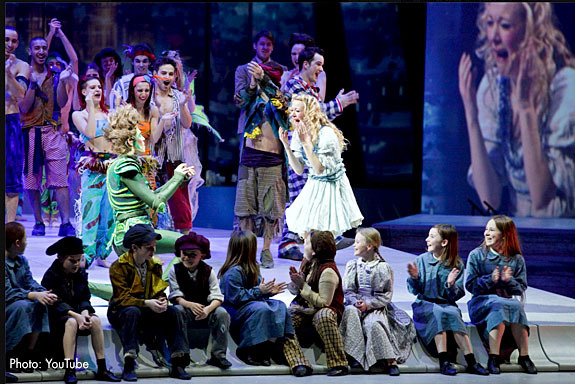 The hometown audience erupted in cheers. The 28-year-old Sturbl told The Daily Record that he had been thinking about proposing to the 22-year-old Young for a while. Sturbl revealed that only a few people knew about his plan. “I had to tell some of the production crew so that they knew to cut the music on time,” he said. Billed as an unparalleled engagement experience for couples who treasure elegance, roses, culture and romance, The Langham Huntington’s “$100,000 Proposal of the Century” is part of a special tribute marking the hotel’s 100th birthday. 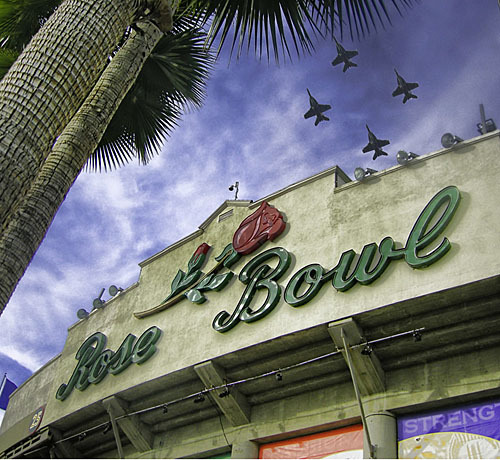 Located in Pasadena, Calif., the home of the famous Tournament of Roses Parade, the luxurious hotel has put together a proposal package that includes a cornucopia of elegant components, including the private and exclusive use of the Rose Bowl Stadium and a $35,000 engagement ring. Imagine the grandeur of delivering a romantic proposal on the field of the iconic — and mammoth — 100,000-seat Rose Bowl Stadium in the presence of 40 of your closest friends and relatives. On the stadium’s giant video message board is an illuminated “Marry Me” message as you get down on one knee and slip a handcrafted, custom-designed 2.5-carat cushion-cut diamond ring on your beloved’s finger. All the while, the 40-piece Pasadena Symphony Orchestra plays in the background while an engagement photographer and videographer document every moment. 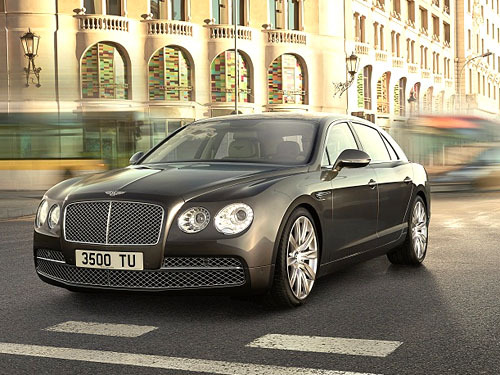 After the celebration, you and your new fiancée are whisked away from the stadium via a chauffeur-driven Bentley Flying Spur sedan, and when you arrive at the hotel, you prepare for two nights in the 3,200-square-foot Tournament of Roses Presidential Suite. Assigned to take care of every need is a dedicated Engagement Coordinator. Your in-suite VIP amenities include a bottle of Louis Roederer Cristal Rose Brut Millesime Champagne, 100 long-stemmed roses, chocolate-covered strawberries, a pair of monogrammed Langham bathrobes and fresh rose petals sprinkled throughout the suite. And each day at the hotel, you look forward to a delectable four-course dinner, which is served in your room. The hotel is promoting the Proposal of the Century as a perfect tie-in to the romantic Valentine season, but the offer will be available through December 29, 2014. An “exceptional” vivid blue diamond weighing 29.6 carats and worth up to $20 million has been unearthed at South Africa’s legendary Cullinan mine — the same mine that has given birth to some of the largest and most valuable diamonds in the world. Petra Diamonds spokesperson Cathy Malins told AFP that the acorn-sized stone could be “in a class of its own.” Displaying extraordinary saturation, tone and clarity, the rough diamond has the potential to yield a polished stone of great value and importance, mine owner Petra Diamonds noted in statement. 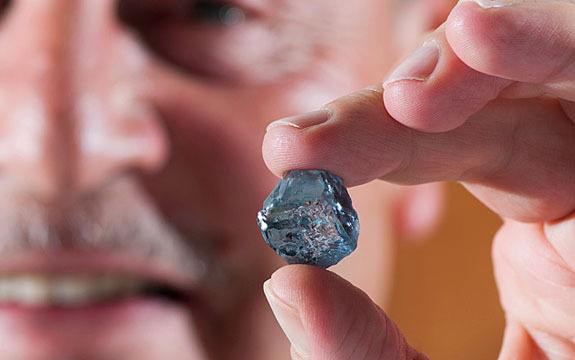 Holding the rough diamond between his thumb and forefinger, Petra Diamonds chief executive Johan Dippenaar commented, “By some margin... this is probably the most significant [blue] stone we’ve ever recovered.” Petra took over the operation of the Cullinan mine in 2008. 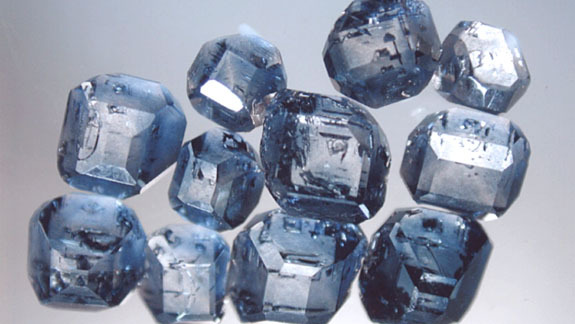 Owing their intoxicating blue color to trace amounts of boron impurities in their chemical makeup, blue diamonds are extremely rare, highly coveted and very expensive. Analyst Cailey Barker told the Huffington Post that Petra’s extraordinary find could bring between $15 million and $20 million at auction. 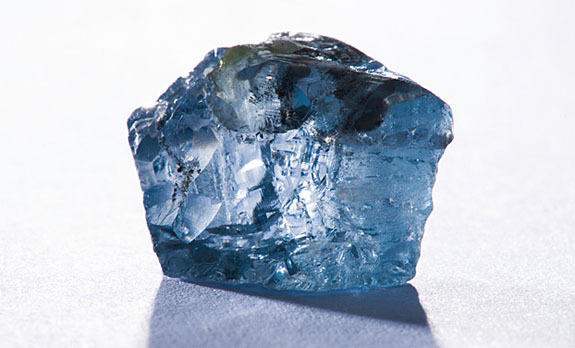 Only last year, a 25.5-carat fancy blue diamond from the Cullinan mine was sold at auction for $16.9 million. A smaller fancy blue diamond weighing 5.30 carats broke the world record for price per carat last year when it fetched $9.5 million at Bonhams Fine Jewellery sale in London. The $1.8 million-per-carat bid eclipsed the previous record holder of $1.68 million per carat. The most famous gem to emerge from the Cullinan mine is the largest gem-quality rough diamond ever found — the "Cullinan Diamond" at 3,106.75 carats. 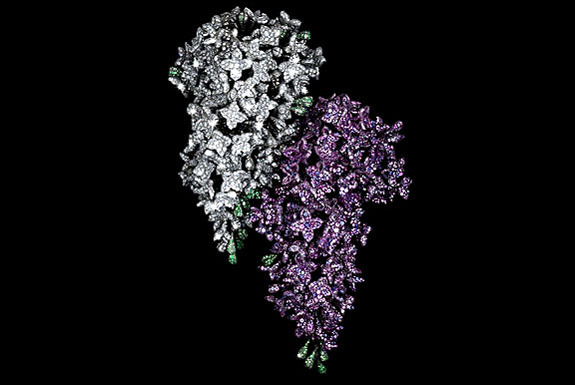 Other magnificent Cullinan-sourced gems include the 545-carat "Golden Jubilee" and the 530-carat "Great Star of Africa." Over its 111-year history, the Cullinan mine has produced more than 750 diamonds weighing more than 100 carats and is considered to be the most important source of blue diamonds in the world. 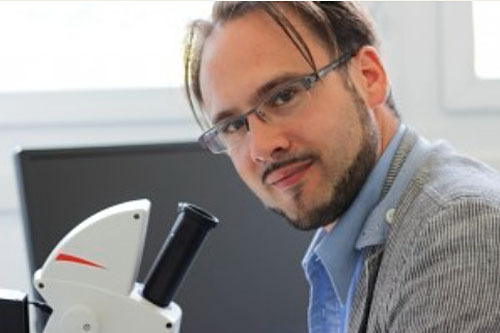 About 10 years ago, Rinaldo Willy was studying how to make synthetic, lab-grown diamonds out of ashes when he came up with the novel idea of turning cremated human remains into eternal diamond keepsakes. 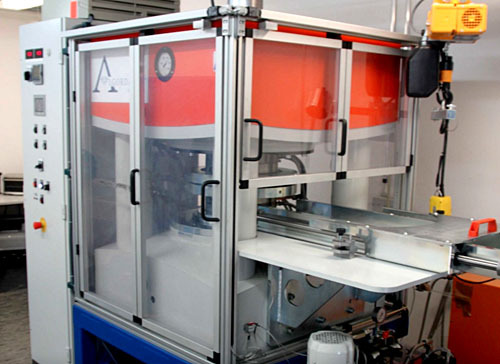 Today, Willy’s Switzerland-based company, Algordanza, is one of the world’s leading providers of “memorial diamonds.” During an average year, the company processes the remains of 800 to 900 people in a high-tech machine that mimics the intense heat and extreme pressure under which natural diamonds are formed about 100 miles below the Earth’s surface. "I don't know why,” Willy said, “but if the diamond is blue, and the deceased also had blue eyes, I hear almost every time that the diamond had the same color as the eyes of the deceased." 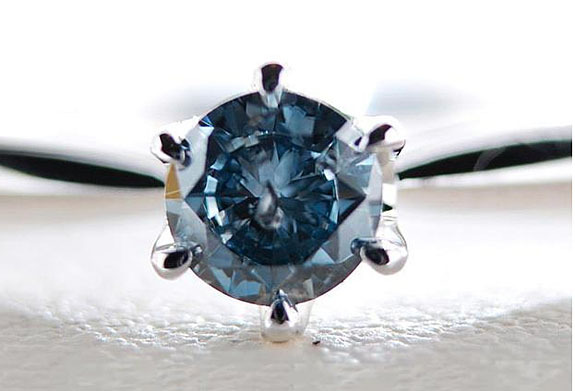 Although blue is the most common color, Willy added that diamonds less often will come out white, yellow or near-black. On one occasion when a white diamond emerged from the lab, Willy was concerned that an impurity may have gotten into the material. He processed it again and got the same curious result. He learned later the deceased had undergone aggressive chemotherapy, which may have altered the boron content of his body. Willy’s told NPR that his customers hail from 24 countries, and revealed that 25% of his business comes from Japan. The scarcity and high-cost of burial plots in Japan could be a contributing factor. It costs from $5,000 to $22,000 to turn a loved one’s remains into a sparkling diamond, with the price determined by the size of the final product. The crystal-growing process takes a few weeks, and the longer the material is in the machine, the larger it will grow. About a pound of ashes will yield a single diamond, according to Willy. Once the rough diamond is extracted from the machine, it is cut and polished into the final faceted gemstone. Often, a customer will have the diamond set into a ring or pendant. 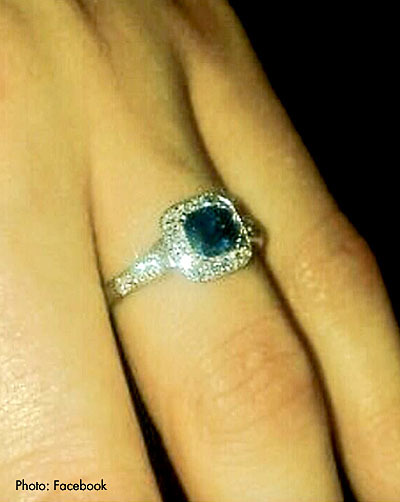 Willy said the diamonds give the family members a feeling that the deceased has returned or is still there with them. Welcome to Music Friday when we bring you awesome songs with jewelry, gemstones or precious metals in the title or lyrics. Today we have rock legend Billy Joel performing “Uptown Girl,” his international hit about a “backstreet guy” trying to romance a privileged girl from the high-class part of town. 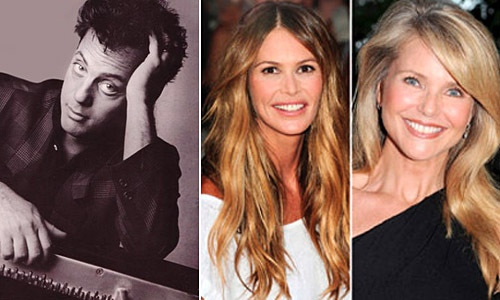 While it is widely believed that the subject of the song is Joel’s ex-wife and supermodel Christie Brinkley, Brit writers Michael Heatley and Frank Hopkinson revealed in The Girl in the Song: The True Stories Behind 50 Rock Classics, that Joel actually penned “Uptown Girl” about an earlier love interest, supermodel Elle Macpherson. According to the authors, Joel drew his inspiration for the song while encountering Brinkley, Macpherson and singer Whitney Houston while on vacation in the Caribbean. Joel began dating Macpherson and wrote the song with her and her girlfriends in mind. The song was to be called “Uptown Girls” (plural). After breaking up with Macpherson, he began dating Brinkley and changed the name of the song to “Uptown Girl” (singular). Brinkley famously appeared in Joel's music video as the “uptown girl” and the couple would eventually marry in 1985. Joel and Brinkley divorced in 1994. “Uptown Girl” peaked in the U.S. at #3 on the Billboard Hot 100 and charted in 11 other countries. The 64-year-old Joel, who was born in the Bronx and raised on Long Island, is one of the most prolific and successful recording artists of all time, with more than 150 million records sold worldwide. He was inducted into the Rock and Roll Hall of Fame in 1999. We invite you to click on the video of Joel’s 1984 live performance of “Uptown Girl” in front of an enthusiastic crowd at Wembley Stadium in London. The lyrics are below if you’d like to sing along. Written and performed by Bill Joel. 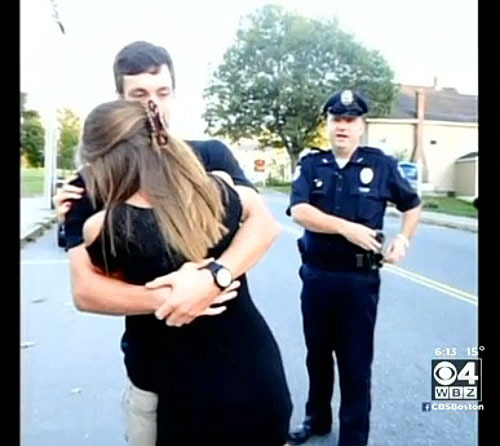 Back in the picturesque town of New London, N.H., for a class reunion, Colby-Sawyer College graduates Matt Van Vliet and girlfriend Samantha Labo had a run-in with the law that quickly morphed into an “arresting” marriage proposal. With an important assist from Acting Police Chief Edward Anderson, Van Vliet hatched a very clever — and somewhat cruel — plan to propose to his girlfriend of four years. 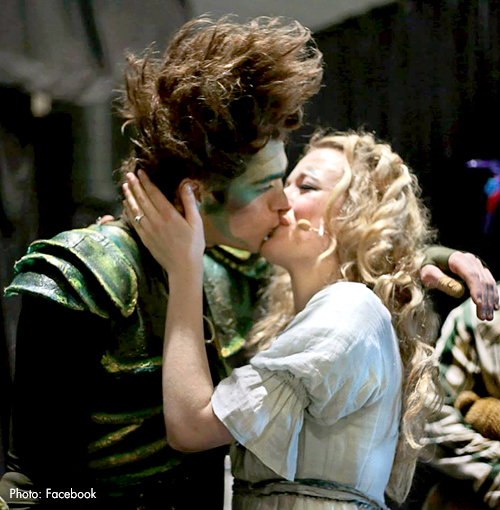 In a very strange way, the proposal is forever linked to the moment the two first set eyes on each other. Anderson reported to work on his day off to take part in the charade. He gladly took on the role of a tough-talking, hard-nosed officer who would not only pull the couple over as they drove to a reunion party, but also sternly reprimand Labo when she asked the officer what her boyfriend did wrong. 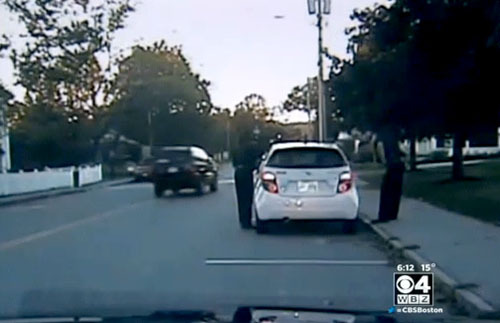 With the police cruiser’s dashboard cam recording every moment, Anderson announced that there was a warrant out for Van Vliet’s arrest and he ordered the couple to step out of the car. Labo could be heard sobbing as she watched Anderson handcuff Van Vliet and pat him down. At that point, Anderson is seen finding a ring box in Van Vliet’s pocket and questioning what it is. As this point, fantasy turns to reality. The boyfriend, now officially out of custody and with a diamond engagement ring in hand, can be seen on the dash cam walking over to his distressed girlfriend, getting down on one knee and delivering his proposal. Sobs of fear turned instantly into sobs of joy. Then, seemingly out of nowhere, a pack of friends merged onto the scene to celebrate the happy moment. The proposal actually occurred on September 20, 2013, but Labo first got a copy of the dashboard cam video on January 18. As soon as she posted it on YouTube, it became an instant sensation. Within a few days, both local and national news outlets were seeking interviews with the couple. 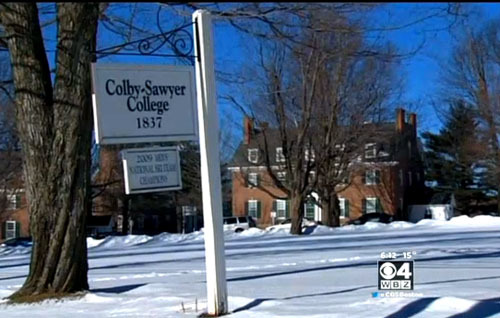 “We kind of met in jail sort of, so I thought it would be cool to include the cops again,” Van Vliet told WBZ-TV. 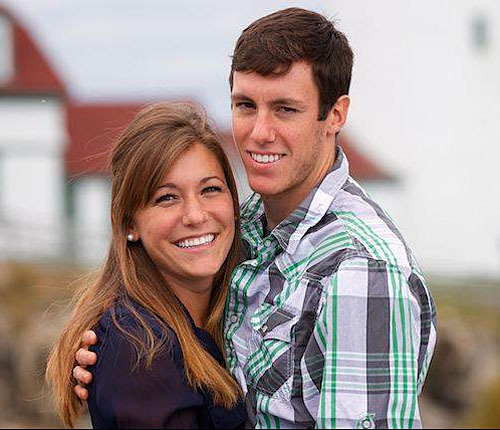 “My mom said surprises were the best way to do it, so I guess I went kind of overboard, but it worked out pretty well.” The couple has set a wedding date of August 22, 2015. 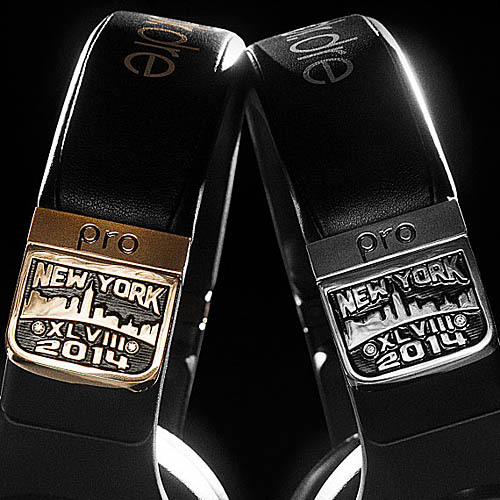 Hip-hop mogul Dr. Dre and luxury jeweler Graff Diamonds joined forces to deliver special-edition gold-and-diamond Beats Pro headphones to every player on the Super Bowl-bound Denver Broncos and Seattle Seahawks. Valued at $25,000 apiece, the headphones are blinged-out versions of the top-of-the-line Beats Pro headphones that retail for $449 and are favored by professional musicians and sound aficionados. Players seemed to love the gift, as they tweeted their thanks and posted photos on their social media accounts. 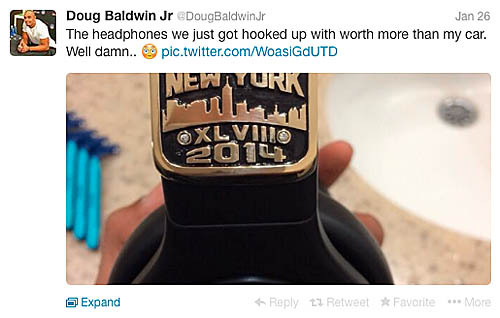 "The headphones we just got hooked up with worth more than my car," tweeted Seattle Seahawks wide receiver Doug Baldwin Jr.
With 53 men on each team’s roster, some quick math reveals that Beats and Graff invested more than $2.6 million for this generous gesture and strategic product placement. These high-profile athletes will be seen wearing their blingy new headgear during the super-hyped days leading up to the big event at the New Jersey Meadowlands, just across the Hudson River from New York City. The impressive headphones will be part of a pre-Super Bowl event at the Graff flagship store in New York City on Friday, January 31. 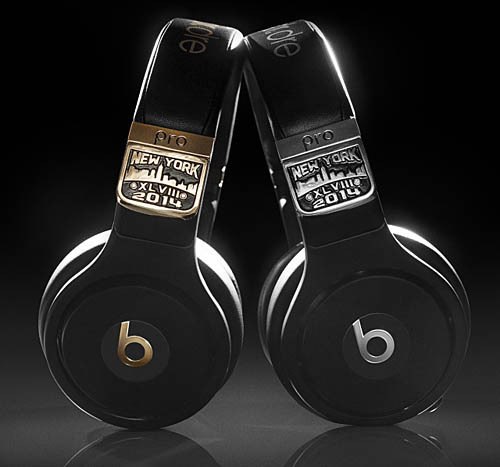 They also can be seen at the Beats store in Manhattan’s SoHo district throughout Super Bowl weekend. White-hot diva Beyoncé rocked the Grammy Awards Sunday night wearing seven statement cocktail rings, waterfall diamond earrings and her own flawless 18-carat (with a “c”) emerald-cut diamond engagement ring. The value of her scintillating jewelry ensemble totaled more than $15 million. 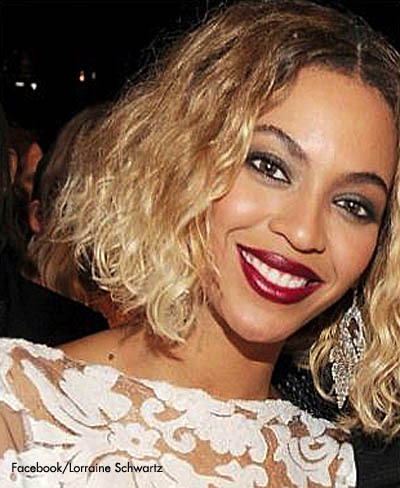 Lorraine Schwartz, who designed Beyoncé’s $5 million engagement ring in 2008, provided the songstress with an impressive assortment of bling for the award show's red carpet. 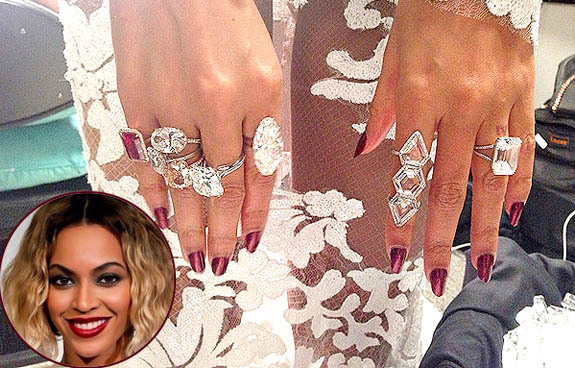 Beyoncé wore six rings on her right hand — three stacked on her right ring finger and one each on her index finger, middle finger and pinky. All the rings featured large diamonds, except for the pinky ring, which was highlighted by a large, rectangular ruby. On the index finger of her left hand was an unusual inline three-stone diamond ring that overlapped two knuckles. The waterfall diamond earrings boasted a total weight of 50 carats. 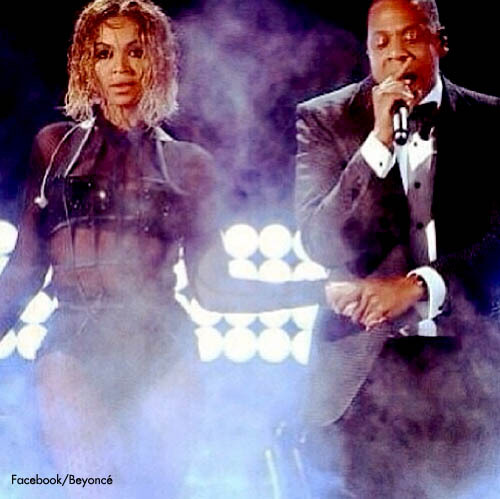 Beyoncé famously sang, “If you liked it then you should've put a ring on it” in 2008’s “Single Ladies,” but on Sunday she opened the Grammy Awards show with a rousing performance of her new song, “Drunk in Love,” during which hubby Jay Z joined her on stage for the final chorus. The deep blue Hope Diamond, arguably the most famous and mystifying diamond in the world, was once specially cut in the 1600s to appear as if a dazzling golden sunburst was emerging from its center. 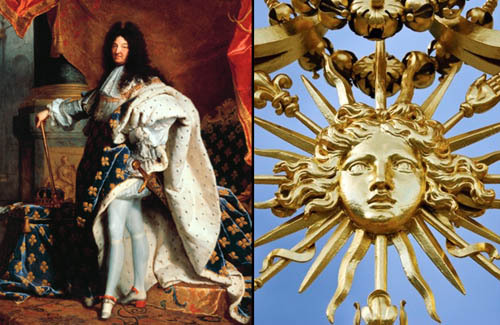 It was a fitting tribute to King Louis XIV of France, who reigned for 72 years and was known as the “Sun King.” The monarch apparently ordered the diamond to be recut with a series of special facets on the back that produced a translucent area. When the diamond was set against a yellow gold background, the vibrant color shone through, giving the appearance of a sunburst. 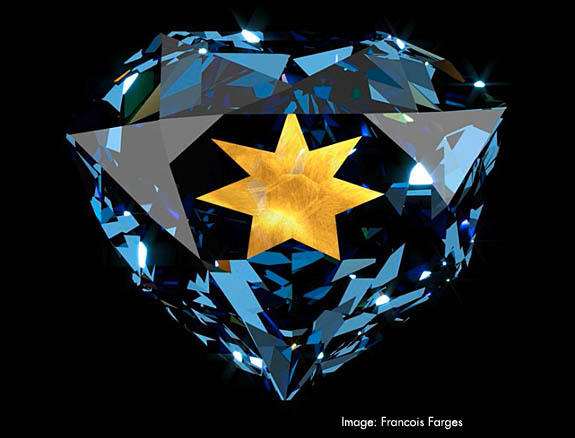 A recently rediscovered 17th century lead replica of the Hope Diamond (then known as the “French Blue”) helped unravel the mystery for François Farges, a professor of mineralogy at the National d'Histoire Naturelle in Paris, and Jeffrey Post, the Smithsonian museum's curator of minerals. 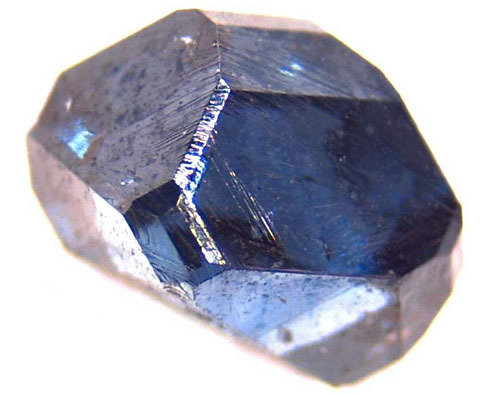 The mineral scientists used computer modeling of the lead replica to simulate what the actual jewel looked like during the reign of Louis XIV, according to Smithsonian.com. 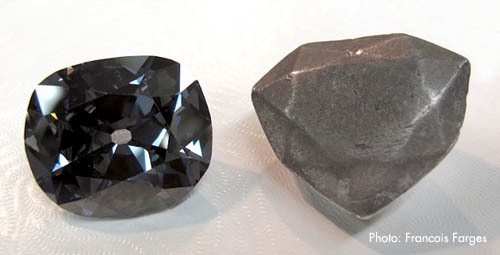 The Hope Diamond, left, placed next to the lead cast of the French Blue. Technically, the French Blue was cut with shallow angles and an entirely flat culet on its back, according to Smithsonian.com. Compared to the rest of the stone, the material right in front of the culet at the gem's center would have appeared relatively clear and colorless, like a glass window. A 1691 inventory of the French Crown Jewels confirmed that the French Blue had been set into gold and mounted on a stick. The mineral scientists believe that if the gem were placed in front of a gold sheet, golden sunrays would have appeared at its center. 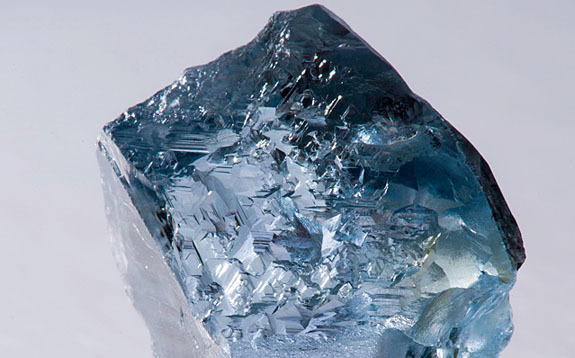 Fargas rediscovered the lead replica of the French Blue in 2009 in France’s National d'Histoire Naturelle mineral collections. This was the first time contemporary gem experts could get their hands on the exact measurements of the actual French Blue. "They didn't even know they had it,” Post told Smithsonian.com. “It was in their collection, but filed under lead specimens." The French Blue was stolen during the French Revolution in 1792 and went missing for 20 years. It finally reappeared in Britain in 1812 in its present shape and weight. 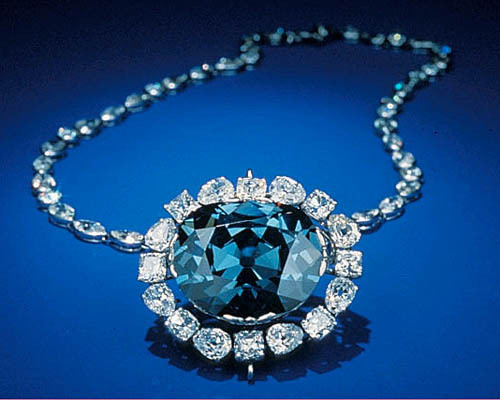 After being acquired in the 1830s by a rich London banker named Thomas Hope, the 45.52-carat blue diamond would become known as the Hope Diamond. Mined in India and brought to France in 1668, the gem currently resides at the Smithsonian National History Museum in Washington, D.C., where it continues to be a top attraction. Keys revealed in a magazine interview that the song was inspired by the tragic passing in 2001 of Aaliyah, an up-and-coming singer, who died in a plane crash in the Bahamas at the age of 22. “It just made everything crystal clear to me,” Keys said. “If I Ain’t Got You” earned two Grammy nominations is 2005 — one for Song of the Year and the other for Best Female R&B Vocal Performance, with Keys winning the latter. The song peaked at #4 on the Billboard Hot 100 list and was #1 on the Hot R&B/Hip-Hop Songs list for six weeks. Keys has sold more than 65 million records worldwide and was named one of the 100 Greatest Artists of All time by VH1 in 2010. We invite you to enjoy the video of Key’s live performance of “If I Ain’t Got You.” The lyrics are below if you’d like to sing along. Written and performed by Alicia Keys.